Install Hammock Library from CodePlex.com, Hammock is a REST library for .Net that greatly simplifies consuming Restful services. Sign in with your LinkedIn credentials. Click on Add New Application and fill in the form. Once your application is created note the API Key and Secret Key that we will use to implement LinkedIn authentication in our application. 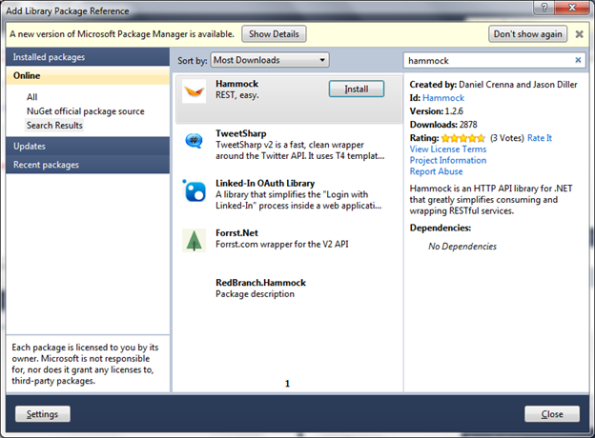 Add references to Hammock library either by manually referencing from folder or just referencing through NuGet in Visual Studio Directly as shown below. CallBack URL will be called when the authorization is successfully done by LinkedIn. Now Create a CallBack page where the callback takes place when the authorization is done after successful login. In my case I have created a Callback.aspx. In the Callback page place following code in the Page_Load method. GetUserProfile method is used to get the Logged in User First Name and Last name to display on Callback page. If you’ve been through the distribution process of an Ad Hoc application, you can appreciate the challenges of getting a build installed on someone’s device. From the differences of working with users on Windows versus Mac machines, to explaining how to import an Ad Hoc provisioning file and the associated build into iTunes, this process is anything but a walk in the park. 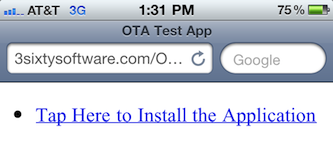 In this post I’ll take you through the steps of deploying Ad Hoc builds over-the-air, where users simply point the Safari web-browser (on their iPhone) to a link and tap to install the provisioning file and associated application. To begin, create a provisioning profile like you would for any other Ad Hoc build. In the image below you’ll notice I created a profile named AdHocOTAProfile and associated this with the app id AdHocOTA. Once the profile is created, download onto your location machine and drag/drop the file onto the Xcode icon, this will install the provisioning file into the following folder: ~/Library/MobileDevice/Provisioning Profiles. The image below is a screenshot of the profile path on my machine – notice the provisioning file name is no longer the nice readable name that was written to your file system when you downloaded the file, this is to be expected. Once you have a working project within Xcode (with the Code Signing identity set as mentioned above), make sure that you set the build type to Device. 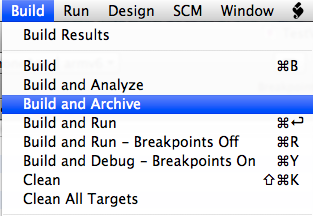 From the Build menu in Xcode, choose Build and Archive (if this option is not highlighted, make sure you’ve selected Device in the build settings. Once the build is complete, the Organizer window will appear – make sure the Archived Applications section is selected on the left panel. In the figure above, I’ve updated the Name of the app to AdHoc OTA Test, this is optional, as well as any comments you would like to include. At this point, don’t worry about the image files, I believe those are applicable only if you are doing an OTA deployment through an Enterprise developer account (internal app distribution for corporations). Update: Seems there may be a little more to how the images are used beyond Enterprise deployments, see the comments section for more information. 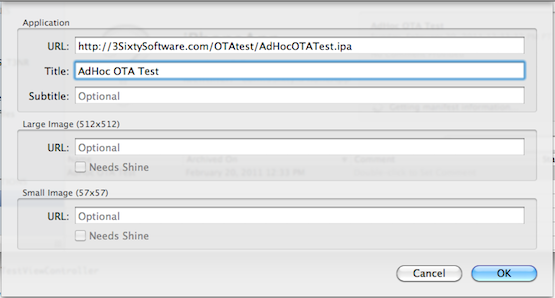 At this point ipa and plist files will be created for you, the provisioning file will be embedded within the ipa. With the build complete, we know need to create a very simple webpage that will allow users to find the application on a web-server. The html below is as about as bare-bones as we can get, it’s nothing more than a link to the file, with a specific href for itms-services which Safari will recognize and initiate the download/install process when clicked. Important: – Replace the path shown above with the path to where you will upload the ipa and plist files that Xcode created. If all works as expected, at this point you can send a link to the html file to anyone you included in the provisioning file and they can install the application OTA. 1. Create an xml file using notepad and save as clientaccesspolicy.xml with the following content. 2. Create an xml file using notepad and save as crossdomain.xml with the following content. 3. Copy these 2 files into web site root folder for example, c:\inetpub\wwwroot. for your IIS (local system) or in root folder of website(c:\inetpub\wwwroot\controlsdemowcf) on server (2008, 2003). As part of my demo preps for all the conferences I’ve spoken at recently I’ve been deploying my LightSwitch apps to Azure websites and I can honestly say that it is by far the easiest way to get a LightSwitch application up and running. Of course you can always manually set up your own server, database and network if you want a purely internal business app like I’ve showed in these deployment posts. However, it’s always hard to troubleshoot what goes wrong when a deployment goes bad because everyone’s environment is a little bit different. The great thing about Azure websites is the environment is hassle-free and already ready for you to deploy your LightSwitch applications. In this post I’ll detail step-by-step how to deploy a LightSwitch application to Azure websites. But first, you may be wondering what the heck is an Azure website and what’s the difference between that and a cloud service? LightSwitch applications can be deployed to both through the Publishing Wizard, but why would you choose one over the other? Azure Cloud Services provide reserved, infinitely scalable, n-tier options running on a Platform as a Service (Paas). Azure Websites are for quick and easy web application and service deployments. You can start for free and scale as you go. So if you do not need all the other services like caching, blob storage, CDN, etc. that the Azure cloud services provide and you only have a LightSwitch application to deploy, then an Azure website is the right choice. 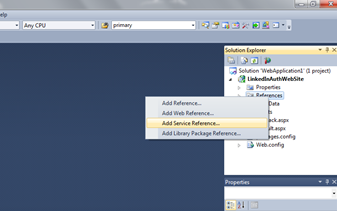 You can have one Silverlight application project (one xap file). Assume it contains two UserControls Page1.xaml and Page2.xaml, and you want Page1 to be shown in Silverlight Control1, and Page2 to be shown in Silverlight Control2 in the same aspx page. if you getting any problem mail me. Required Params : uid, pwd, phone, msg. provider : way2sms(default), fullonsms, smsindia, whozzat, smsinside, site2sms. if you do not specify any provider, way2sms will be used by default. codes : 1. Send this if you require a user friendly msg from the server. for example, if codes=1 is not provided the server will return the result as an integer.